San Diego Chargers wide receiver Keenan Allen celebrates after scoring a touchdown in Sunday’s game against the Oakland Raiders. SAN DIEGO (AP) — There was no way the Chargers could get through Sunday without doing some serious scoreboard watching. Buffalo’s 19-0 win against Miami was being shown on the scoreboard video screen while the Chargers were warming up for their game against Oakland. Updates of New England’s 41-7 victory against Baltimore were shown during the game. "I was going to know, somehow," said quarterback Philip Rivers, whose Chargers needed both Miami and Baltimore to lose to stay alive in the race for the AFC’s second wild-card spot. The Chargers still had to do their part, which they did with a 26-13 victory against the hapless Raiders. San Diego overcame three turnovers while benefiting from two turnovers and 12 penalties for 73 yards by the Raiders. The Chargers (8-7), who have won three straight games for the first time this season, head into their finale still needing help. They have to beat Kansas City at home while needing Baltimore to lose at Cincinnati and Miami to lose at home to the New York Jets. 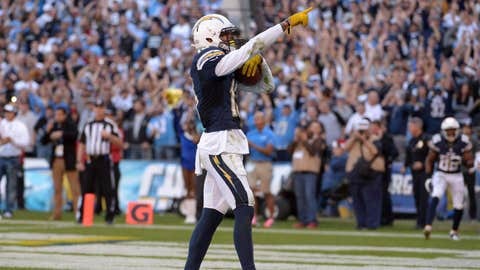 "All three went our way today, including the one we had our control in," Rivers said. "Same boat next week. We need all three to go our way. The only one we can control is the one here against the Chiefs." Rivers threw a go-ahead, 4-yard touchdown pass to rookie Keenan Allen with 5 minutes left in the third quarter and Ryan Mathews ran for 99 yards and one touchdown, setting a career high with 1,111 yards. Nick Novak kicked four field goals for San Diego. "The Chargers are still beating and I know no one wants to play us right now, that’s for sure," said safety Eric Weddle, who had an interception. Oakland could have pulled within one score, but Rod Streater couldn’t hold on to Matt McGloin’s 39-yard pass as he came down in the end zone with 4:38 left. Oakland challenged but the ruling was upheld. Oakland turned it over on downs with 54 seconds left and lost its fifth straight game. "It shouldn’t have been close, but they don’t give you any extra points for winning by a bigger margin," Rivers said. "Just find a way to win." Oakland (4-11) helped San Diego, too, by committing a dozen penalties. Mike Jenkins was penalized 15 yards for taunting Mathews after he pushed the running back out of bounds. Allen scored six plays later. "We had too many penalties," Raiders coach Dennis Allen said. "A lot of our penalties, specifically defensively, came on third down, which allowed them to extend some drives." The game was tied at 10 after a sloppy first half that included three turnovers by the Chargers and seven penalties for 39 yards by the Raiders. The only score of the first half that wasn’t set up by a turnover was a 27-yard field goal by Novak in the first quarter. Early in the second quarter, Rivers wasn’t ready for a shotgun snap and the ball bounced off him for a fumble that was recovered by former San Diego State linebacker Miles Burris at the Raiders 42. The drive stayed alive when Mychal Rivera leaped to catch a 37-yard pass from McGloin, and Darren McFadden scored on a 5-yard run on the next play for a 7-3 Oakland lead. Rivers was picked off by Mike Jenkins to end San Diego’s next drive, but Weddle then intercepted McGloin at the Raiders 20, deflecting the ball to himself. That set up Mathews’ 7-yard run and the Chargers regained the lead at 10-7. San Diego forced the Raiders to punt from their 40 but rookie Keenan Allen’s fumble was recovered by Shelton Johnson at the 16. The Raiders had to settle for Sebastian Janikowski’s tying 20-yard field goal with 10 seconds left before halftime. "Really, the series of the game was us holding them to a field goal at the end of the half," Weddle said. "That gave us some momentum. We made it interesting for a while but the better team won today. Just a great team win to have everything on the line and to struggle for a little bit but to show some character and toughness to overcome those issues we had. Novak kicked three more field goals in the second half, from 48, 28 and 33 yards. Janikowski added a 42-yarder. "We were right there in the game," Oakland’s Charles Woodson said, referring to the halftime tie. "There really wasn’t a whole lot that needed to be fixed. It was a close ballgame, our game to go out there and win." NOTES: Mathews limped to the locker room in the fourth quarter but later returned. He had a bandage on his left ankle afterward. … Chargers tight end John Phillips injured a knee in the first quarter and didn’t return. Chargers safety Marcus Gilchrist was shaken up in the second quarter but returned.